Rosa Salazar shines as a not-quite-human heroine in this long-awaited manga adaptation produced by James Cameron. That’s a useful skill to have in Iron City, a near-dystopia living under the long shadow cast by the aerial city called Zalum. The hoi polloi are kept earthbound in the overcrowded metropolis, never allowed to ascend to the supposed paradise above them — unless, that is, they become the final champion of an absurdly dangerous sport called motorball. Featuring a roster of mechanically enhanced competitors who’d just as soon kill one another as put a point on the scoreboard, it leads to some of the film’s most kinetic sequences — and a chance for Alita to meet her maker. As fate would have it, the skills that make one an elite killer lend themselves well to motorball. 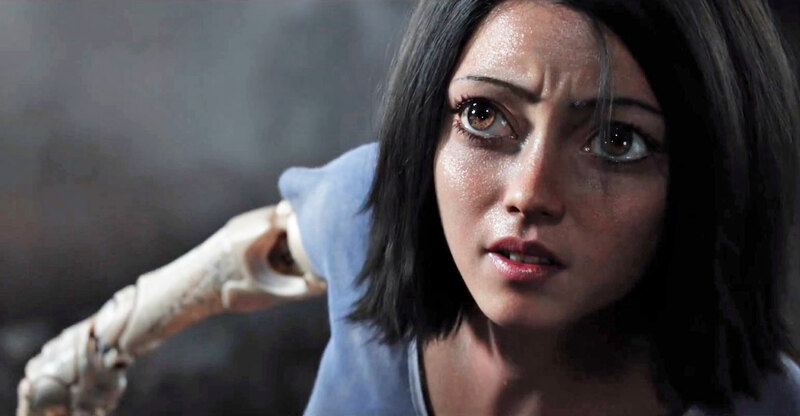 Alita discovers these abilities quite by accident and, pure soul that she is, longs to use them as a means of discovering her own secrets and truths. What few details we do see are glimpsed in brief flashbacks that show enough to fill in the most important blanks while also keeping us guessing as to the bigger picture slowly being revealed. The two central mysteries — Alita’s past and what exactly is going on up there in Zalem — are, of course, connected, but even when adhering to familiar tropes (which is often) “Alita” carves a unique space for itself on the strength of its endlessly likable protagonist. Salazar, whose human form most recently materialized in “Bird Box” and the English-language remake of “The Kindergarten Teacher,” has graduated from supporting act to leading lady with grace and grit. Her motion-capture performance is one of the most impressive we’ve seen this side of Andy Serkis, with a physicality that’s enhanced by digital trickery but a spirit that’s all her. Salazar is backed by Jennifer Connelly, Jackie Earle Haley, and Ed Skrein in the ensemble cast, but it’s Mahershala Ali who most compels in a small role — as stylish here as he is at award shows, the actor brings his one-of-a-kind presence to the role of a sophisticated baddie who’s constantly being possessed as an unwitting vessel by the film’s largely unseen villain. James Cameron, who first became interested in directing “Alita” nearly 20 years ago, co-wrote and produced the film that “Avatar” made him too busy to helm himself. It clearly benefited from his involvement, but Rodriguez was the right man for the job. He seems invigorated by the material, delivering his best film since “Sin City” and creating a fleshed-out world that’s vivid enough to make you wish you could see it through Alita’s eyes. “Alita: Battle Angel” will be released in theaters by 20th Century Fox on February 14.